Today was the last World Campus – Japan 2015 day for some of us, including me. In the morning we met some of the local kids who are taking english classes. We played multiple games with them and talked to them in english. After that we got to experience calligraphy. A japanese lady showed us how to do and it looked really easy, but in the end alot of us were struggeling. While we ate we got to talk to the ladys who had demonstrated how to make the sushi, and they were all very nice. In the evening we had our Arigato event. It looked like the host families had a great time, and so did we. After the event was over, we had a potluck party. 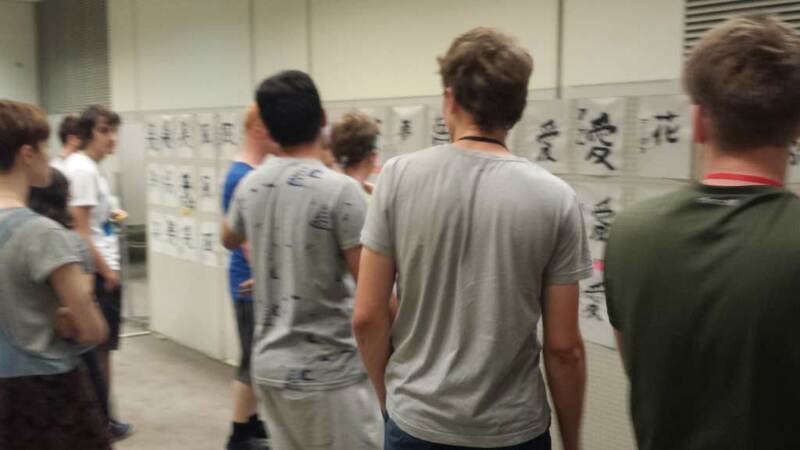 And the host families selected three kanji (Chinese characters) from the calligraphy we did that they thought were the best. At last we all said goodbye and went home with our host families. Tomorrow is host family day, and after that most of us have to leave Japan again. But I hope I get to see everyone again.